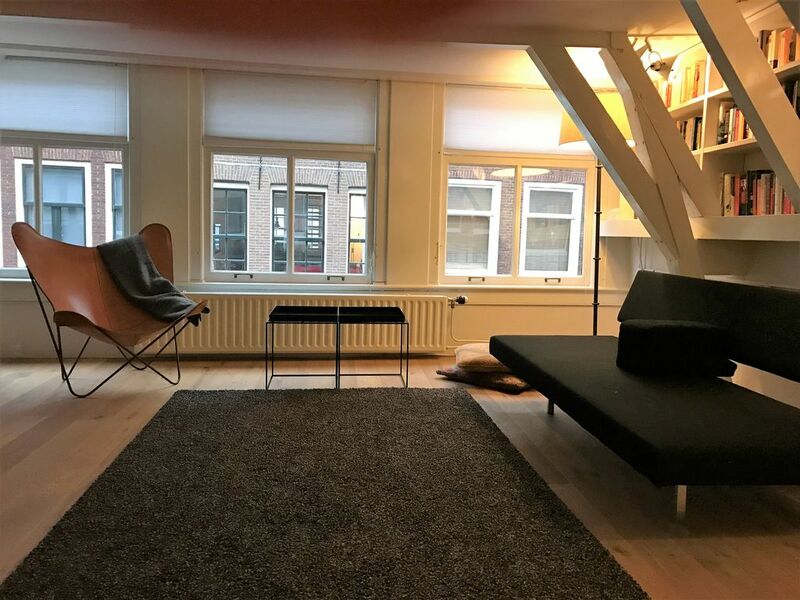 B & B in a split level loft in a listed Dutch national monument located in the old historic center of Amsterdam and walking distance from shops, museums, restaurants, pubs and public transportation. This recently renovated loft is good for couples, solo adventurers and business travelers. It is beautifully designed and has a smart TV, a Nespresso machine, a washer dryer, a hot air oven and a cooker-plus tap to make a nice quick cup of tea. As is the case in most typical Amsterdam houses. Therefore the place is not really suited for children under the age of 15. Long term lease is also an option with a third bedroom and second bathroom. Rent and amenities to be established in consultation. The place is very suitable for "retreat" and "Amsterdam life". University, opera house, academy or music, museums are all nearby. We loved staying in the heart of Amsterdam! Everything is within walking distance. Marjorie has so many wonderful Dutch goodies for us! Everything was super clean and comfortable! Would totally stay again! The perfect host in a perfect location! My husband and I, and two adult children, just returned from a wonderful vacation in Amsterdam. We stayed at Marjorie's lovely apartment and we found it to be perfect -- clean, comfortable, and welcoming and she was the perfect host! It is fully equipped, with everything you could need. You know what they say about location -- location, location, location -- yes, this was the ideal location; centrally located so that we could easily walk to everything in Amsterdam (we walked over 50 miles during our 6 day stay and it was awesome!). A close walk to Amsterdam Central Station for those day trips outside the city. Marjorie's place is located on a quite street but restaurants, bars, shops and a grocery store are all within a one block walk. Do not miss the Saturday Market just steps away from her entrance. Everything you could possibly want. We just loved it and I would highly recommend you staying with her. We surely will when we return to Amsterdam! The location was perfect for us. This was the best homeaway place I have ever stayed at! Marjorie was awesome. She helped us determine what to do during our stay and responded immediately when we had questions about the neighborhood. One thing that really made our stay special.... the mattresses! We were both well rested everyday mostly due to the high end mattresses. I recommend this place 100%. I will stay there again on my next visit. Marjorie was a great host with a great flat! We had such an awesome stay at Marjorie’s place! She met us and answered all our questions and gave us a great recommendation for dinner when we got in to amsterdam. It was also my birthday and Marjorie left a birthday note and goodies for us to share, it was a very kind and sweet thought. We would definitely stay again next time we are in Amsterdam! The apartment is amazing, with great amenities and only a short walk from the Centraal Station and the Nieumarkt. It is also almost directly across the street from Lambiek, which is one of the oldest and best comic book stores in Amsterdam. Due to a scheduling mistake on my part, we had an issue that we were able to resolve with Marjorie fairly quickly. She handled our mistake graciously and allowed us to stay an extra night. I would absolutely recommend this location for a group of travelers. Just make sure you verify your booking dates so that landlords like Marjorie don't have to deal with your mistakes. Very nice accommodations in the heart of the city. We enjoyed our stay here in the Nieuwmarkt area of Amsterdam. Steps from a Metro sration, but generally quiet street. The apartment was very neat and comfortable. Stairs can be a challenge for large luggage, but if you are prepared not a problem. Very Dutch experience. Our host made the kitchen very welcoming and we appreciated the fresh flowers. Thank you Marjorie.